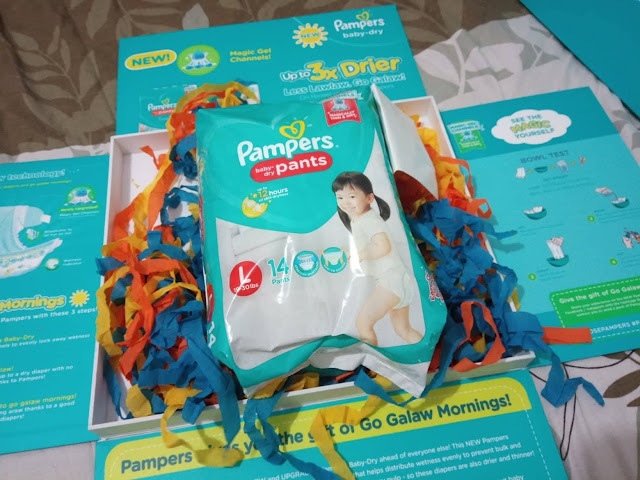 She's The Mom: Goodbye LAWLAW, GO GALAW With The New and Improved PAMPERS BABY DRY! Goodbye LAWLAW, GO GALAW With The New and Improved PAMPERS BABY DRY! Brianna excitedly unboxed the surprise box of the new and improved Pampers Baby Dry and asked if she can wear it. Haha! Gone are the diaper days for us but I can vividly recall those precious time when my now toddlers are still babies. And, all of them got to use Pampers, it's one of our to-go-to diaper brands. Choosing the best diaper for our babies could be a tricky task as there are a lot of diaper brands nowadays. In choosing the right diaper, we must take into consideration our babies motor development. Studies have shown that learning to walk without any bulk in the body may be the best. All that bulk in lawlaw diapers compromises balance as he or she learns to walk. Moving, playing, and walking are crucial for baby’s growth and development. Unrestrained movement allows babies to discover the world, and learn like there’s no tomorrow. When babies pee, wetness is often accumulated in a single spot on the diaper. This causes the lawlaw! Moms know that when the diaper sags, it’s full and time to change. The diaper is wasted because all the wetness is concentrated in one spot, instead of spreading through the whole diaper. The accumulated wetness increases the likelihood of leaks so if diaper easily sags, moms end up changing the diaper more often and spending more. Pampers understands that lawlaw is a major problem for moms and babies alike. This is why Pampers introduced a new and improved Pampers-Dry, now with magic gel channels which are found in the Premium Care line. These new cores absorb wetness faster and distribute it evenly throughout the whole diaper preventing sagging. This does not only offer overnight dryness but makes the diaper thinner and drier, putting an end to lawlaw, and promotes unrestrained movement for your baby. Since Brianna won't be wearing the diapers, we put the new and improved Pampers Baby Dry by doing the Bowl Test. Every mom would want to keep her baby dry and comfortable for a longer time, it also means less diaper changes in between, and most of all, focus on quality bonding with her baby, as he moves and learns to go galaw. So mommies have you tried the new and improved Pampers Baby Dry yet? Share you experience below. Uni-Pak Mackerel Sandwich Recipe + Giveaway!